This article was originally published on Smart Company. The results are in. And startups across Australia have spoken. Media coverage is the number one need for founders in the next six months according to the latest Startup Muster report. So you’ve got a great product, what do you do next? Well at the very early stages you probably don’t need an agency. The time to think about external support is when you have a working product with a pipeline of regular news and the need for customers, staff, partners or investment I’d say as a rough guide. These steps should help with taking what you want to say and turning it into something the media will care about. As a founder you’ll be used to giving your elevator speech at networking events. Which is great. However you’re not always going to use the same pitch for securing media coverage. And only telling people what you do won’t be enough. Unfortunately you’re not the only one spruiking your wares. And sadly not everyone will care about your startup or the product you’ve just launched. So maybe hold off on the press release for the beta launch of version 4.1. You need to give a journalist a reason to write about your story. A hook. – Do you have a product/service which is genuinely new and different? – Or has a tech giant like Facebook, just bought a company that operates in your space? – Or has the government allocated more funds for R&D in your industry? 2. What makes a story? Tying yourself to the news agenda will give the journalist a better chance of getting a story greenlit from their editor – because not only is it topical, but it’s part of a wider trend which is in itself newsworthy. Give them what they need. Firsts – has your startup created a world-first or global breakthrough in research? A familiar product/service with a new twist – are you the Uber…for gardeners? An interesting backstory (profile interview) – did you meet your co-founder while dancing naked round a fire at Burning Man? Reaction to big news – if a journalist is going to be writing a story anyway, why not send your thoughts for what it means for your industry as they’ll require sources to stand up their story – e.g. comment on what Instagram’s latest update means for retailers. Look at what the journalist you’re contacting has written before and suggest something similar or a well argued follow-up. Don’t add to the 100’s of irrelevant emails a journalist receives on a daily basis. Key Takeaway – create a ‘why now’ moment for a journo, focus on how you differ from competitors and tailor your approach by taking it to someone who will care. You wouldn’t try to sell an industry-leading-proprietary-turnkey-SaaS-tech-stack-solution to a market greengrocer. So don’t try and convince a journalist who focuses on entertainment that your marketplace for pigeon fanciers is the hottest ticket in bird-tech right now. While we’re at it, keep your writing simplified. Jargon, like the paragraph above, seeks to exclude others. Buzzwords indicate a lack of understanding. And cliches demonstrate a limited diction. PR needs to be targeted, just as your startup needs to be appropriately positioned in market. 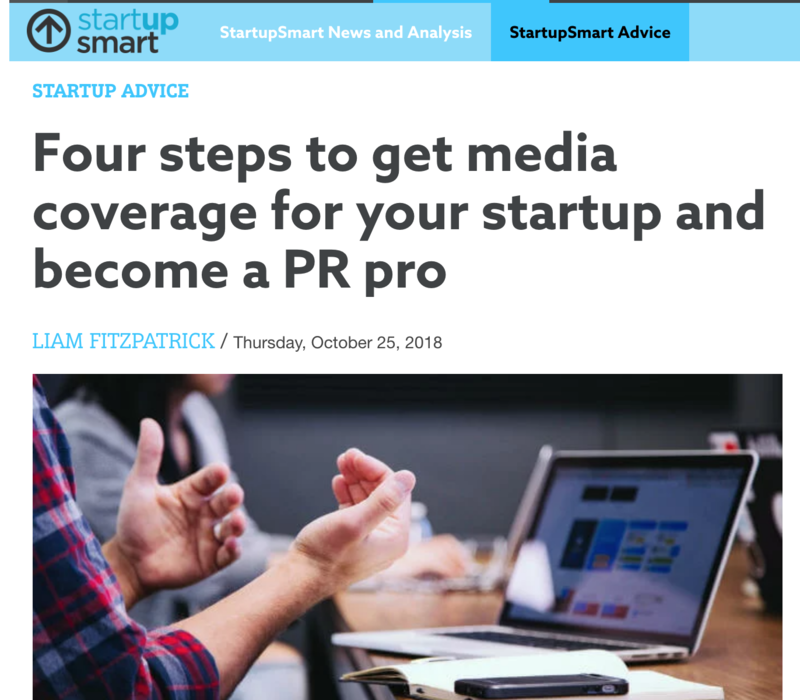 If you’re speaking with a startup journalist, there’s a good chance they’re going to be interested in funds you’ve raised or the new way you’re targeting the market. If you’re speaking to a writer with a retail beat (subject they cover), why not focus on the impact or behaviour change your product is having on customers. Journalists are consumers too. They don’t understand your internal corporate-speak. A quick litmus test is if your parents can’t understand how you’ve explained it, you haven’t simplified it enough. And remember personality and even humour is allowed in pitching. Key Takeaway – research what has worked previously with a journalist and add your own unique stamp on it. Journalists have deadlines which are increasingly short. By reading what they write about, you’ll get a sense for what might be coming up and when you can pre-empt with an authoritative viewpoint. Through providing value to them, you can start to become relied on and even have the journalist coming to you for comment. So make yourself available and deliver on any promises. There are enough people that don’t to make you stand-out. Key Takeaway – It’s all about showupability.